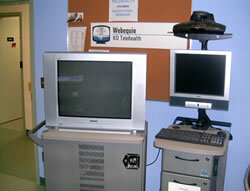 On June 2005, the Webequie First Nation KO Telehealth was in full operational. This isolated community of 700 native people now can access better health services by the usage of the Internet Broadband technology. The people of Webequie can access Health specialists in major cities like Toronto, Winnipeg, Thunder Bay and even the world. The Community Telehealth Coordinator (CTC) was hired by the band to provide the Telehealth services to the overall community. For more information on Webequie KO Telehealth click here to view their Website. Telehealth uses computer and television technologies to send and receive information about how people are feeling - their personal health. One of the most popular uses for Telehealth is to visit doctors who have special knowledge about things like eye problems, ear infections, broken bones, mental health, heart problems, and skin diseases. The visit happens on a private television channel. You see and hear the doctor on the screen and the doctor sees and hears you - even though you both might be separated by hundreds of miles. Community health workers also use Telehealth to learn more about ways to understand illness and to help people feel better. They use tools like the computer and the internet and telephone and television conferences to learn from other people and from each other. This is a way that community health nurses, community health representatives, home care workers and support people can continue their health education. Telehealth is changing all of the time to include new uses. One of the most exciting new uses is called televisiting. Some people who have to stay in hospital for a long time - with a difficult pregnancy or for cancer treatment are able to use the private television channel (videoconference) to see their families in the communities. Telehealth is also starting to be used to help people understand and deal with diabetes and other personal health problems. Yes. The private television channel that you use can not be seen by anyone but the people who are in front of the cameras - the doctor, you and sometimes a CHN or CHR. Yes. Telehealth services will help people in respective communities to get answers about their health more quickly so good treatment decisions can be made. Will Telehealth be the only way I can see a doctor? No. Telehealth is being introduced to improve health services in all communities. Health Services will continue to increase community access to General Practitioners. Telehealth will be mostly used to make specialists easier to see. Will Telehealth reduce the number of health workers in our community? No. Our Telehealth plan is to use Telehealth to support local health workers (so they feel better about their jobs) and to introduce new standard services in all NAN communities. Why is there so much talk about Telehealth right now? Keewaytinook Okimakanak has been working hard during the last three years to restructure and improve First Nations health care services. Telehealth is part of doing this. We are working with a group of hospitals in Northwestern Ontario and the Winnipeg Health Sciences Centre to create a regional Telehealth network.